Imagine that you are walking along the sidewalk, trying to get to the coffee shop on the corner. But the person next to you is leaning against your shoulder, keeping pace with you and pushing you away from it. There is only one way you are going to make it to the coffee shop (short of belting the guy!). You have to lean into him to such a degree that you overcome the force of his push and the speed at which he is applying it. 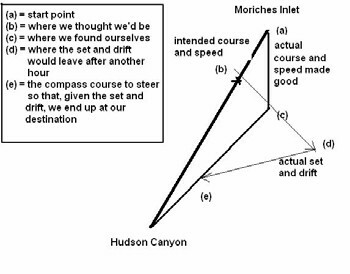 This is the essence of “Set and Drift” when navigating as well. So, you do – and when you’ve traveled the amount of time specified, you find yourself way to the east and south of your mark. Why? Because the tidal forces of the Hudson have been just like that guy outside the coffee shop. The set (direction) of the tidal current – on your starboard quarter in this example – pushed you to port (to the east of the rhumbline), while its force (drift) added to your speed – and pushed you further south than engine speed alone would have taken you. But how many degrees should you have turned to starboard in this example? Rather than trial and error (“Turn a little more, dear…Wait, now a little more, dear, wait…”), couldn’t you calculate it precisely? Yes, you can! Captain Andrew Tucci is the Captain of the Port and Sector Commander for US Coast Guard Sector Long Island Sound. Captain Tucci is responsible for all active-duty, reservist and auxiliary Coast Guard personnel within the Sector. As a Commodore of the US Coast Guard Auxiliary First District, Southern Region, Vin Pica works closely with Captain Tucci and his staff to promote boating safety in the waters between Connecticut, Long Island and 200 nautical miles offshore. Sector Long Island Sound Command Center can be reached 24 hours a day at 203-468-4401.